Our Dynamic Positioning (DP) Courses will give the students a thorough knowledge of the practical aspects of DP operations. They will be capable to plan and conduct any DP operation, including risk assessment, contingency planning and assessment of vessel capability. 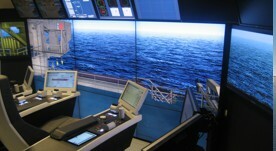 Dynamic Positioning (DP) is now a major facility, and is being routinely fitted in new as well as established vessel types. DP functions are in regular use across a wide range of environments such as Drilling Rigs, Offshore Support Vessels, Floating Production Units, Survey Vessels, Shuttle Tankers to name but a few. Vessels frequently need to conduct operations of a safety-critical nature, close to platforms or other fixed structure. In operations of this it is essential that the vessel is able to work to its maximum efficiency, and this includes the competence of Watchkeeping Officers, and DP Operators, who must be properly trained. Guidelines from the I.M.C.A. called "Training of Key DP Personnel" relates to the training and competence of all personnel who have a critical role to play on board DP-capable vessels.